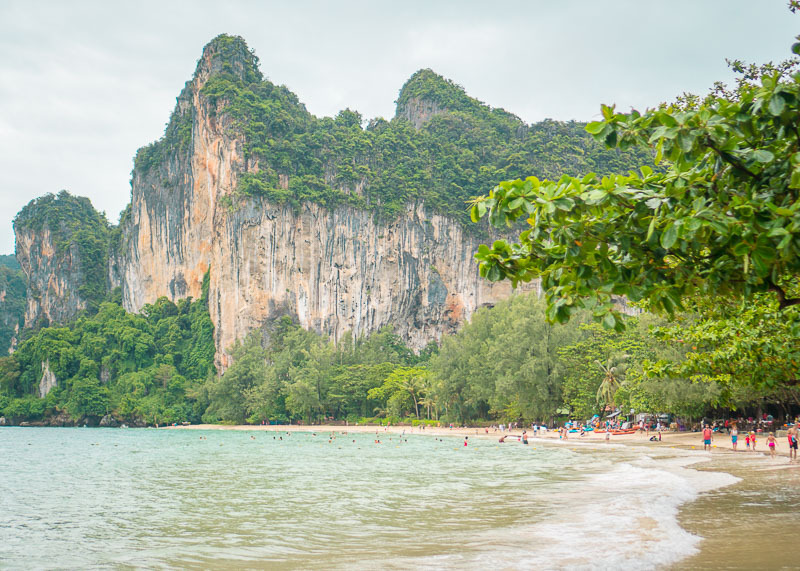 After spending a few days in Krabi, it was time to leave the beaches of Thailand and head to the big city! Stopping by Bangkok was intentional and Gary laughed at me when I told him why I needed the Bangkok stopover. I needed some time to be in a city where there are malls, and I can eat in establishments with clean food standards. It’s also a good stopover to add in case we needed to buy something that’s hard to find in the smaller cities. To get to Bangkok, we could either fly or take the train from Krabi. We decided to take the overnight train to Bangkok to experience train life in Thailand. Since the train actually leaves from Surat Thani, we needed to figure out a way to get from Krabi to Surat Thani first. Based on our quick pros and cons list, taking the bus was the clear choice for us. 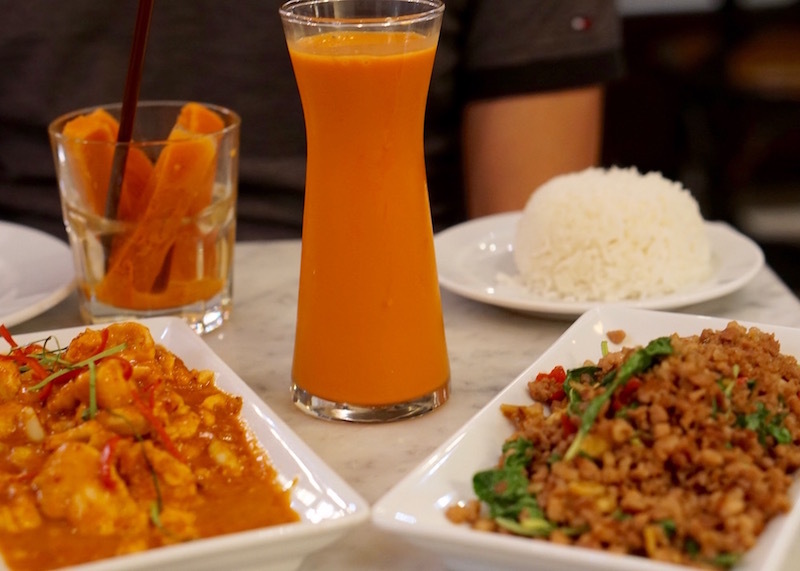 Since we are spending a year travelling and living the nomadic life, we had the time to see Thailand in a way that we would never be able to squeeze in a short vacation. Buying the tickets was straightforward. 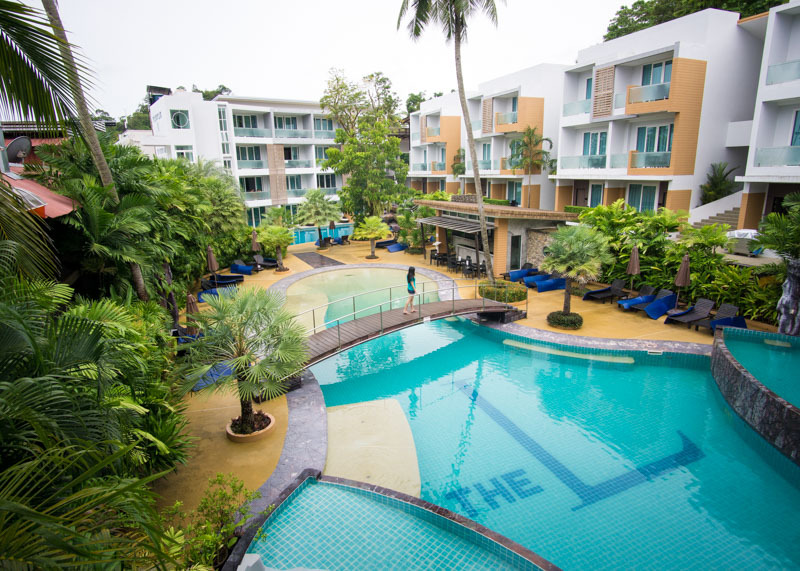 You can either find a booth in Krabi that sells tours, or you can book through your hotel. 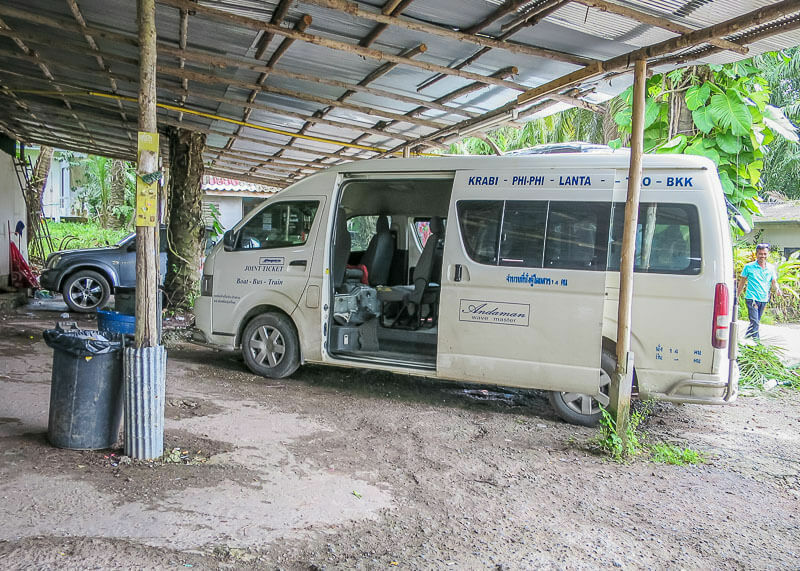 Our hotel initially told us that they only booked private transfers, which left us booking through a tour kiosk on the street (huge disaster!). Long story short, the agent ended up charging my card three times while saying the charge didn’t go through. She then asked me to go pay in cash instead and wouldn’t book the bus transfer for me. Luckily, I managed to talk to another person at our hotel who was able to help us book a bus transfer. I also managed to get a refund from my credit card, but it was a huge headache. 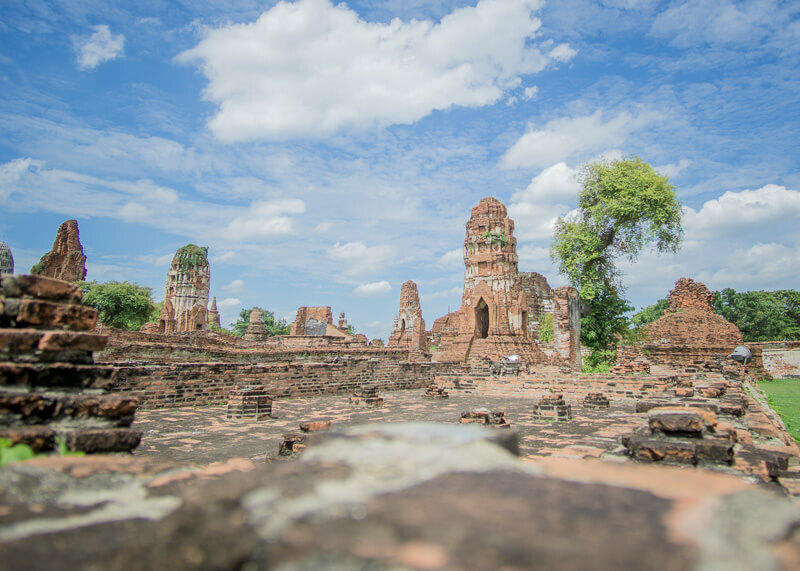 You can read more about what it’s like to book tours in Thailand in this post. 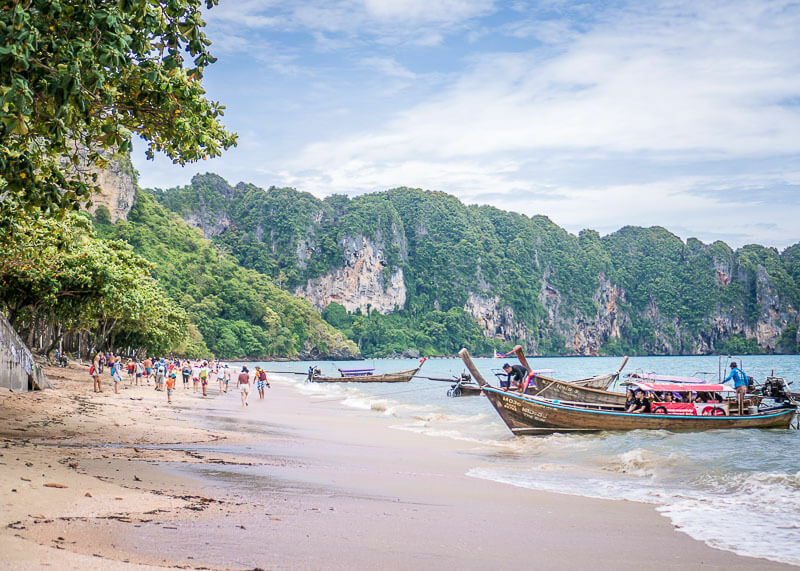 While it’s about the travel kiosks in Phuket, the experience is similar in Krabi. If you want to book your tickets in advance, you can consider 12Go.Asia, but it will be pricier than booking in person. On the day of departure, our driver comes to take us to the bus terminal, where we would catch another bus to get to Surat Thani. We wait for our 11 am pickup, and 20 minutes later, he arrives. 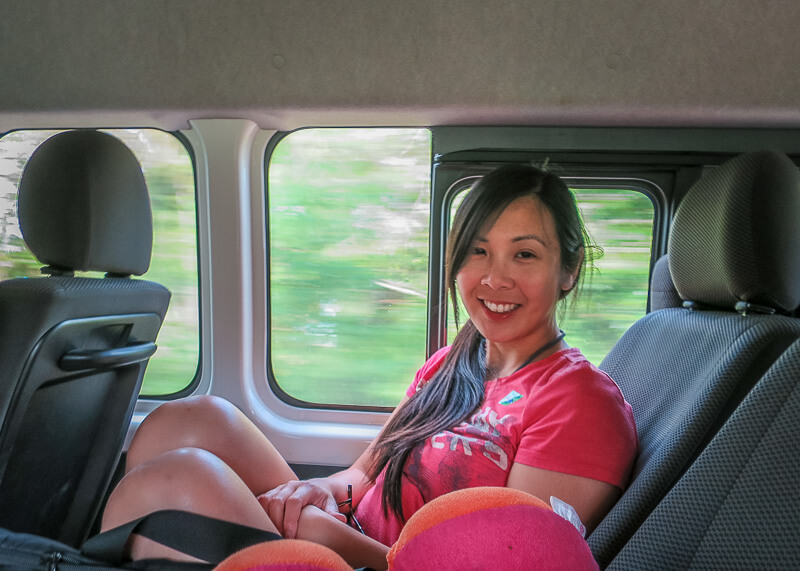 It was an uncomfortable ride; the van was in bad condition and lacked proper ventilation. I opened the window for air, only to get yelled at by the driver to close it. His wife and young son occupied the front bench with him. The son must not have been over four, and he was crawling around, playing with the suitcase wheels. The driver was also a bit off. He looked distant and he had trouble holding his head up. It wasn’t until we got off that we smelled the alcohol. Thank goodness it was a short ride from our hotel to the bus station. Despite his erratic driving and speeding through red lights, we made it alive to the terminal. We exchanged our tickets and are told to wait. By now we know better to not bother asking how long the wait will be. Their answer won’t matter anyway. We were perplexed as to why the journey takes four hours when the actual drive is only 2.5 hours. Now we know – they buffer in wait time for the next bus. Ants are crawling up my legs, and miniature flies swarm me. Everyone around us seems to be smokers, and the toilets are terrible. An hour passed and we’re still waiting. More than ten small vans have stopped by this area since we arrived. We both crack up each time a passenger gets off the bus because they all have the same look on their face: confusion. We probably had the same expression the first time we arrived at the bus terminal. I mean, there is virtually no communication on what’s going on – the bus driver just stops and tells you to get off. No one ever really tells us what happens next so we sit and people watch. To be fair, we also can’t speak Thai, which makes communication a lot harder. The other tourists are all in their early twenties, mostly European and they all speak French. All are carrying huge backpacks. One girl’s backpack is so big that she’s just dragging it on the ground instead of wearing it on her back. I get it, that’s why I gave up on backpacks. 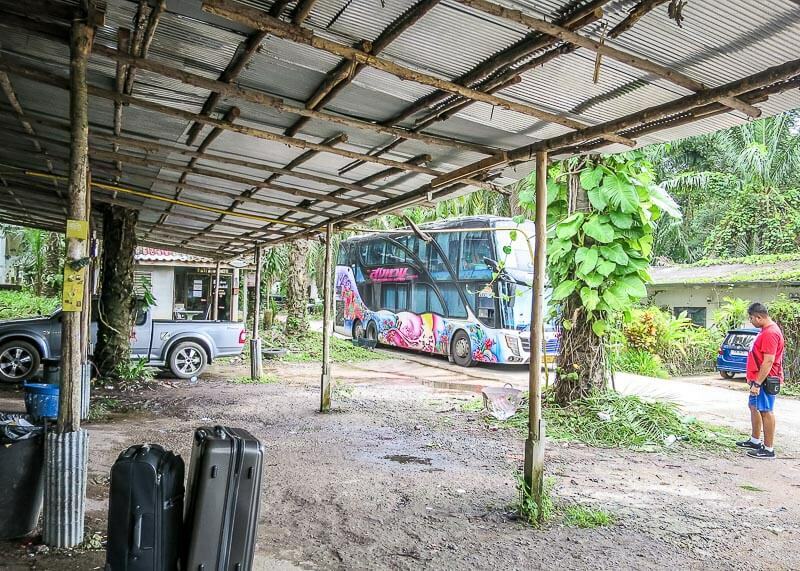 After waiting for a really long time, a double-decker bus suddenly appears from the jungle! The huge double decker bus! Definitely looked out of place! Don’t you agree that the bus looked like it emerged from the jungle? We board a double-decker bus almost two hours later. All the kids are going to Koh Samui or Koh Phra Ngan (party island). Only three people were heading to Surat Thani: me, Gary, and another solo traveller. We were the last to board the bus since we’ll be the first to get off at Surat Thani. The staff members tell us that we will have to switch to another bus in ten minutes. Thirty minutes pass and google maps says we are heading straight to Surat Thani. We get on the bus and of course, no two seats are available side by side so I find a seat next to a French girl. As I sat down, I smiled and said hi, which made her get up and move. Well, that was easy – I just got a seat for Gary. 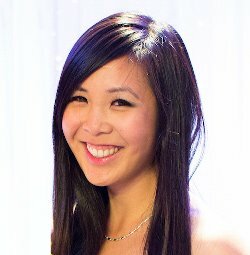 People avoiding me because of my English and accent actually happens quite often in Asia. I think it’s because most Europeans think that I am a local trying to scam them in Asia. It reminds me of the days when I used to cough while standing in a long line-up during the SARS era and… suddenly, I’m the next to be served! You know, when I imagined bus transfers, I was expecting the two vehicles to be in a parking lot for the switcheroo. Maybe in western countries, but not so in Thailand! Our transfers happened on the side of a busy highway! 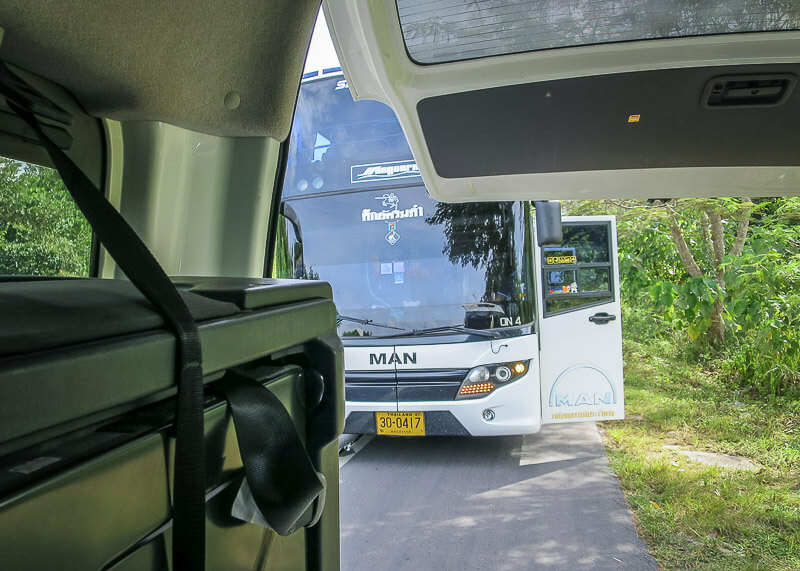 The double-decker bus was continuing to Koh Samui while we were transferred to a minibus to take us to Surat Thani. Saying goodbye to the double-decker bus! There was no warning of when we were supposed to transfer. The bus just stops and a staff member comes to us, telling us to GO GO GO! 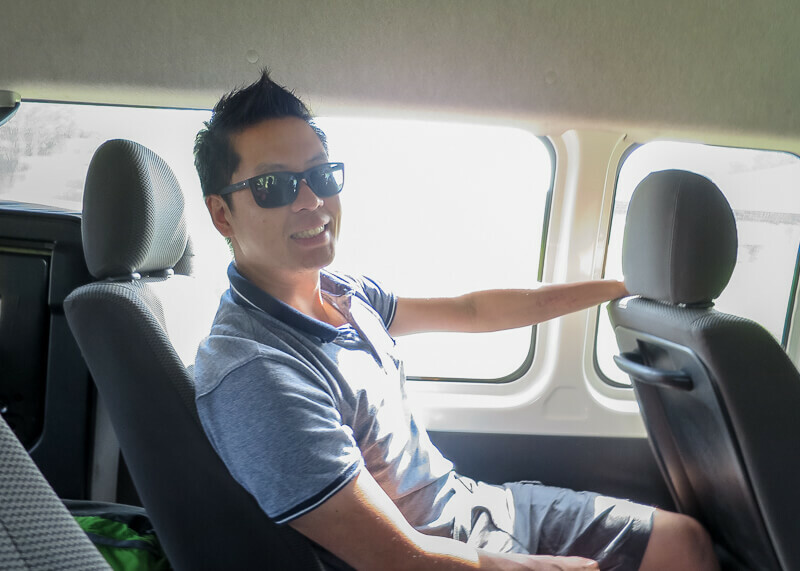 Yep, this minibus ride for three was much more comfortable and cleaner than the previous minibus! After a good 30 minute drive, we finally arrived safe and sound to the station. Now the fun part; waiting for three hours at the Surat Thani station to catch our overnight train to Bangkok. I’ve read countless reports where passengers find missing valuables when travelling on buses. I took these incidents into consideration when buying our luggage to prevent theft. Luckily, we sat on the bottom of the double-decker bus where our luggage was stored right behind us. Luggage space was another concern we had while travelling on the bus, but it wasn’t a problem for this part of our trip. Aside from the fact that our driver came to pick us up with alcohol breath, we felt safe during the drive from Krabi to Surat Thani. 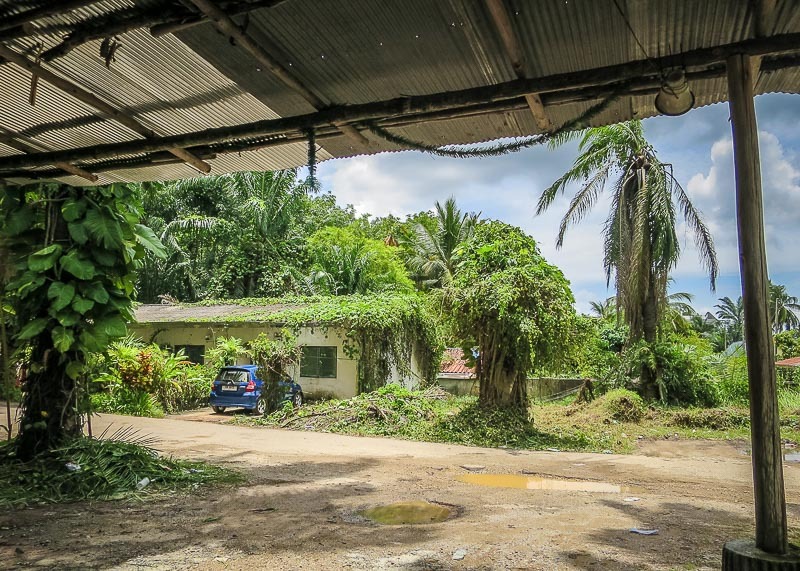 We didn’t arrive at the Surat Thani station until 3:30 pm, which was three hours before our scheduled train departure. The ride did, in fact, take four hours although it felt a lot longer since we had no idea what was going on. There were washrooms on the bus, but I have no idea what condition they were in because we didn’t use them. Can you ask questions in English? Communicating with the employees was difficult. Even the ones who spoke decent English didn’t give us the right details about our ride. Can you charge your phone? Sadly, there was no place to charge our phones on the bus ride. 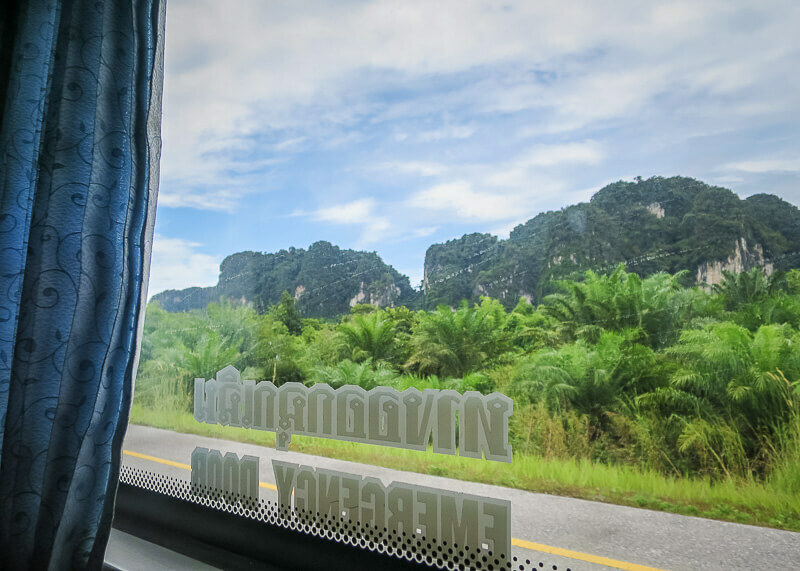 Was it worth taking the bus from Krabi to Surat Thani? 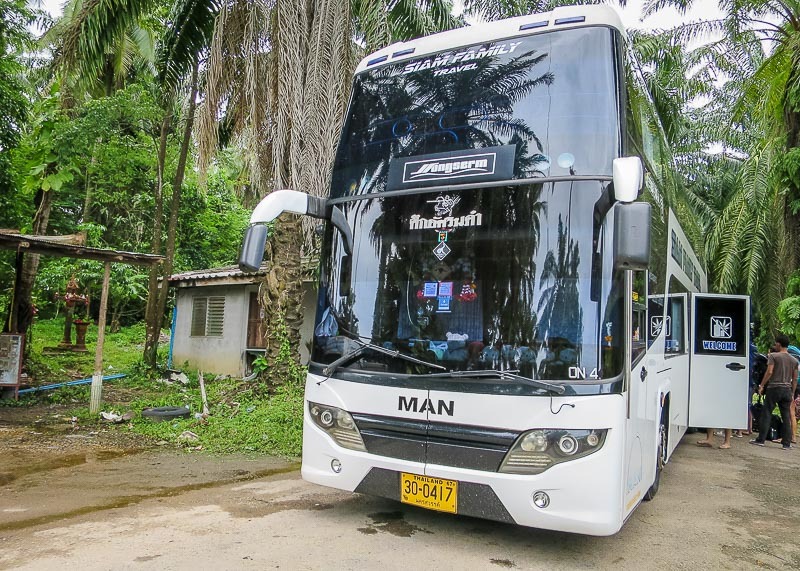 For the price, comfort, and speed, I wouldn’t have a problem with taking the bus from Krabi to Surat Thani. The experience was memorable and made our year of travelling much more interesting. But, if you’re tight on time, it might be better to consider flying from Krabi to Bangkok. a) A whistle. It’s my SOS tool to call for help. One each. b) An old (seldom used) Smartphone. To take sneaky pictures of the taxi driver, the taxi and the taxi licence plate – just in case you need to file a police report. You can distract the driver while Gary snaps away – shooting from the hip, playing dumb. c) A large caribiner. The rock climbers uses this type. You can fit more fingers inside it. Use as a weapon when held in a tight fist. You can hang a water bottle, a baseball hat or a plastic bag full of snacks on it – even the airport TSA official will not think twice about it. But it’s great for self-defence. Going through Customs, I would hang my baseball hat on it – as a decoy. Quite the experience. The nice thing about the double decker bus are the views from the top. Great way to take pics of the scenery as you pass by. Would you take the bus again even if you weren’t pressed for time? 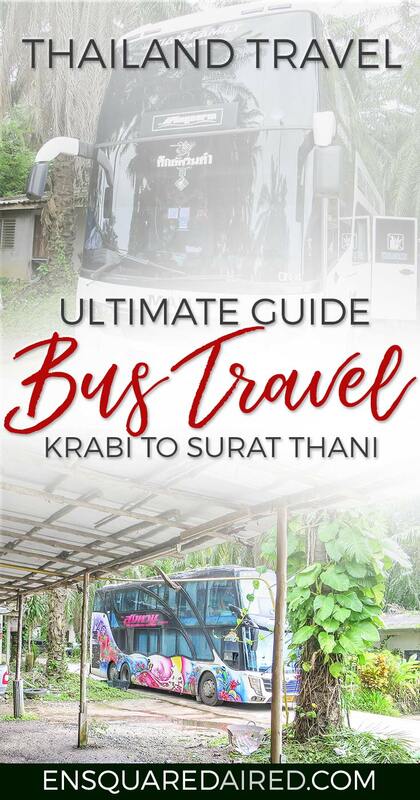 How about going to Krabi Town bus terminal next time and getting a scheduled bus from there, rather than letting yourselves be shepherded around by sharks. Wise up backpackers! In case you haven’t noticed, this is a bus terminal :). 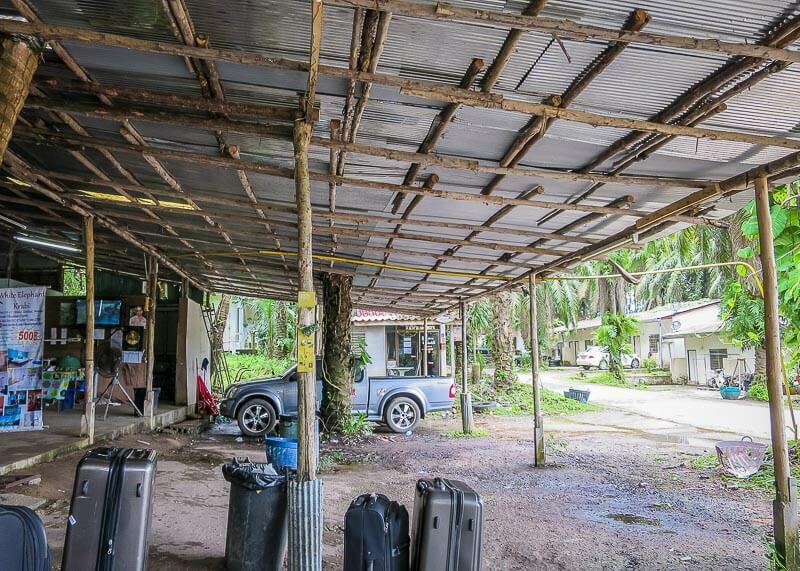 It would have been a 30-minute drive to the main Krabi Town bus terminal (which we’d have to figure out ourselves), versus this one, which was a 10-minute drive and prearranged for us. 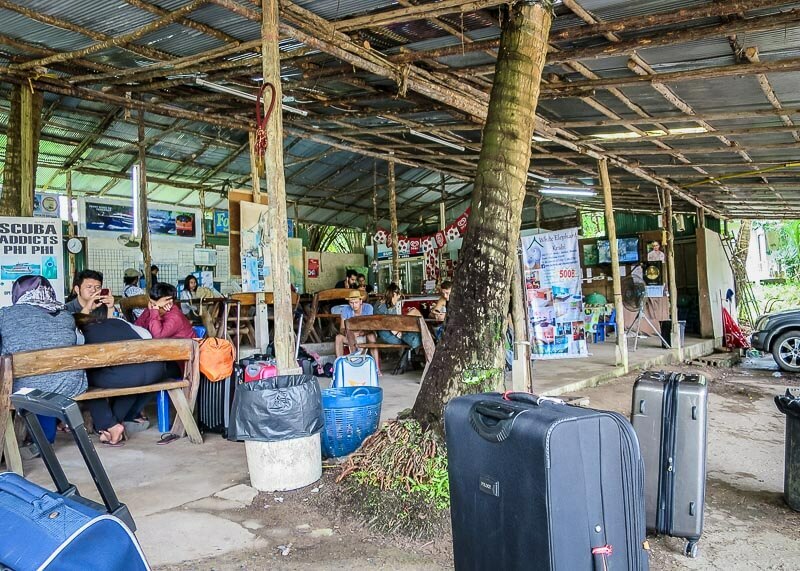 It’s something for future travellers to consider, especially if their accommodation is close to the Krabi town bus terminal. I’m not sure why you’d make such a generalization and call them sharks when the most significant issue was that we couldn’t speak Thai and they didn’t know much English. I’m also quite sure they may have gotten minutes/hours and numbers confused (I get that wrong ALL the time when I’m trying to learn a new language). 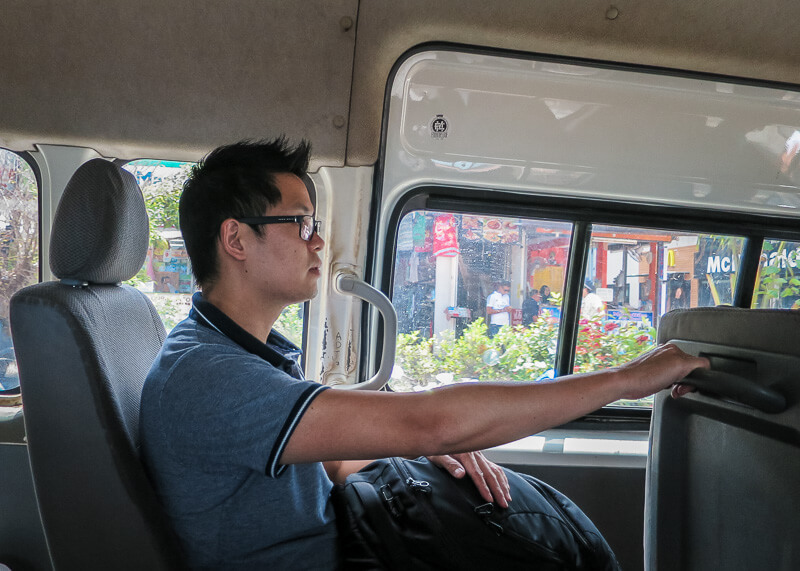 I also wanted to share this experience because I read numerous articles online about how dangerous it is to take the bus in Thailand (ours, as you can see, had ups and downs but nothing was stolen and we arrived at the train station in one piece).